A striking single rose and rosebud with dew drops still on the petals make a lovely picture by our own Barbara Baatz-Hillman. An eye-catching colorful Monarch butterfly is on the wing to take in the fragrant nectar of the rose. 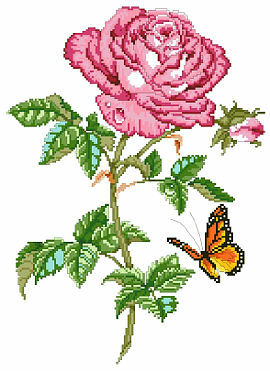 Stitch this along with the companion piece Striped Parrot Tulip as they would make a splendid pair.